Hello everyone! How’s your week going? I’ve been busy unpacking and getting things sorted over the past 2 days. Hoping to do some blog post planning tonight and get some crafting done over the weekend. Today I’d like to share my take on the Simon Says Stamp February Card Kit – I’ve created a masculine Valentine’s Day Card for my hubby. This time I made a small 4 1/4 inches square card. I’m rather new to this format, but I think I like it and will probably keep using it in the future. 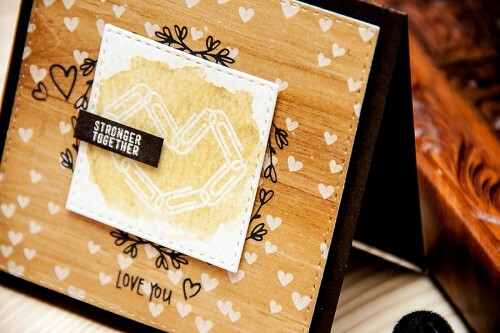 Now this card features several simple techniques – there’s emboss resist and watercolor using gelatos. The adorable paper clip heart in the center of my card was heat embossed onto Tim Holtz watercolor paper using clear embossing powder. Watercolored look was achieved using gold gelato + a bit of water. 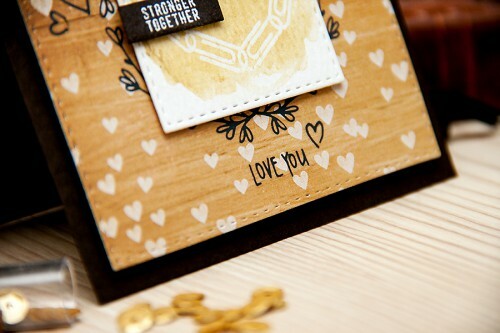 I also used fabulous rub ons from Crate Paper to add a little something extra to my card. 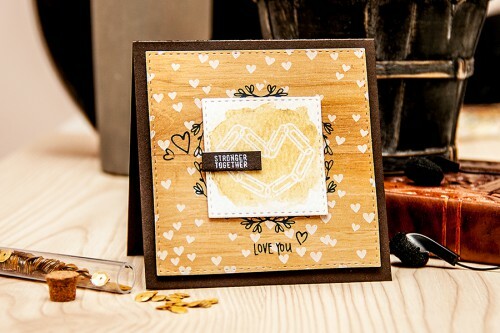 I used one behind the die cut piece with a watercolored heart, one more at the bottom and also several rub-on hearts. If you like it, please give it a thumbs up and share. Thanks! A great very manly Valentine’s card. Love it. You made a great card…I am always looking for ideas to make masculine cards and appreciate the inspiration! Everything blends together very nicely. Thanks for showing the use of gelatos as an element on the card. The gold gives the resist with the watercolor look plus the extra shine. Love it! It’s not always easy to come up with masculine cards and this one is spectacular; thank you for sharing. A great masculine card. Thanks for sharing it! A great masculine card. There are never enough of those around! This Masculine card is just beautiful with gelatos look, perfect colors! Wow! Love every detail you added on your card, Yana! I’ve never used the gelatos, and your card want me to give it a try. Thanks for the inspiration! I love valentines cards that are not pink. This one is perfect! I like that watercolor with the woodgrane a lot! Cant wait to get my kit! Glad you’re home – safe and sound! Marvelous card – love it! I am really loving this card kit. The cards mad eby all the design team have been so fun including yours. Thanks for the chance! thank you, everyone! I’m so glad you liked this project!